I recently came across a copy of Architectural Digest. 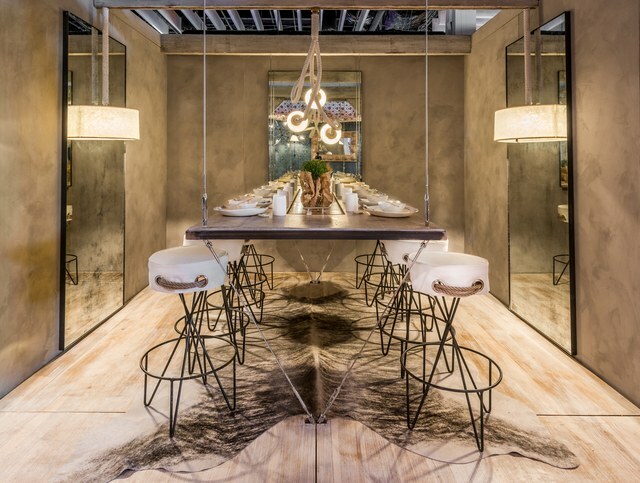 It was featuring the DIFFA Dine by Design fundraiser that took place during the AD Design Show 2017 in NYC. It was a spectacular trade show featuring designers, vendors, artists and artisans. I felt so fortunate to be able to attend. Seeing the article made me reminisce about the inspiring display of creativity I witnessed while walking through the venue. I'll begin with the Dine by Design section. 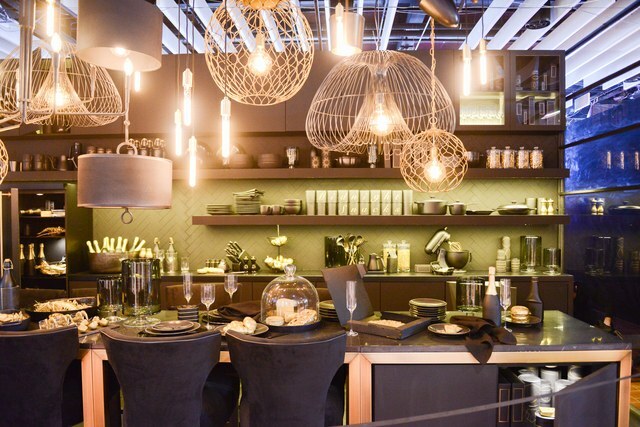 One of my favorite dining spaces was from Crate & Barrel. 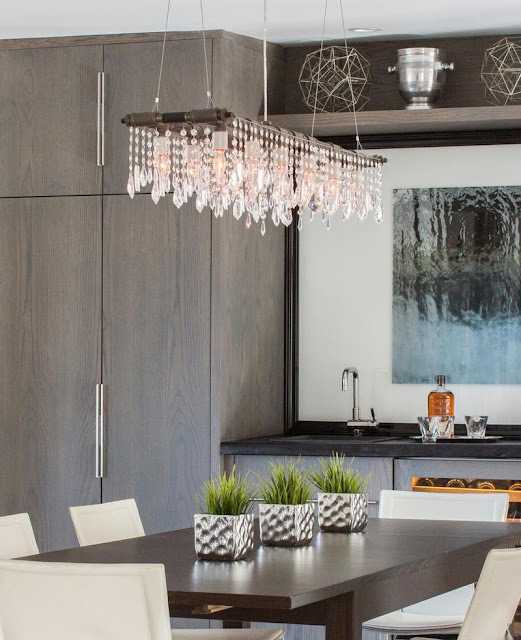 The dining space was moody and modern. 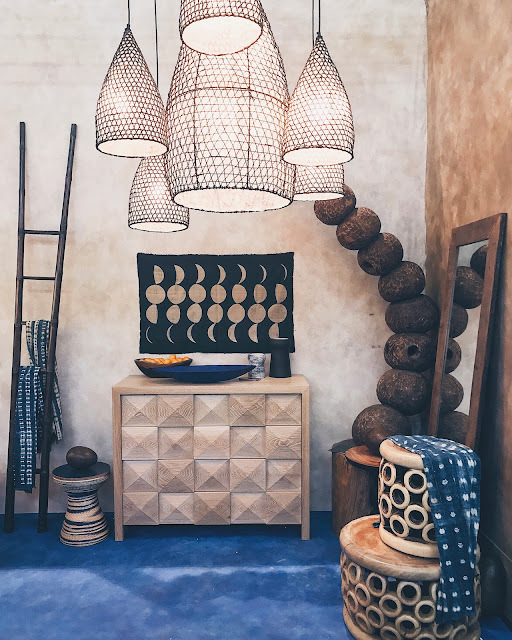 I loved all of the hanging pendant lights. 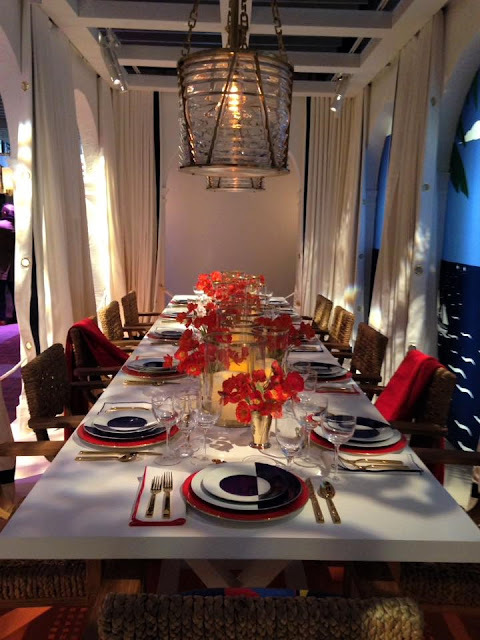 Ralph Lauren Home created a nautica- themed table with retro travel posters and white plastered walls. I loved the huge ship light pendant. 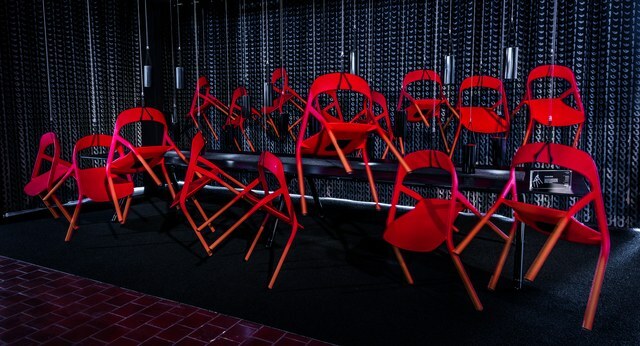 Because of its artistic flair, I really appreciated the all black table with hanging red chairs. 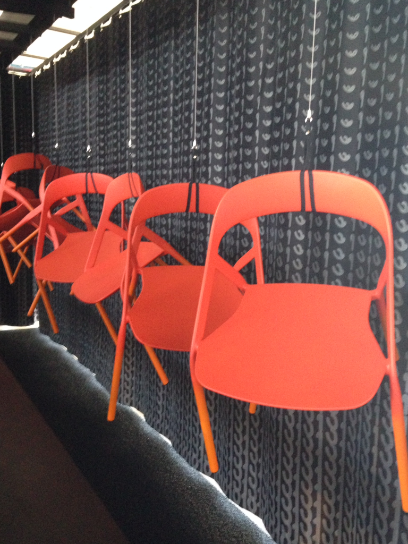 It was by Perkins & Will, Steelcase, Coalesse, Designtex, Empire Office and Arktura. It was symbolizing the effort that is needed to fight HIV and AIDS. Another table-scape/setting I loved was the urban-antique style from Blue Ocean Design. 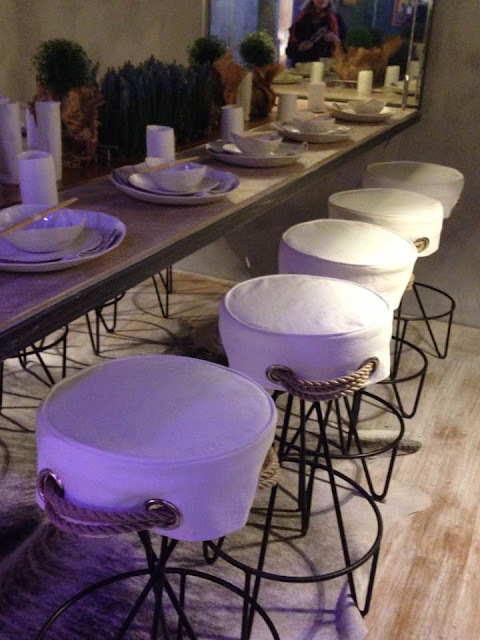 There was a cool nautical vibe happening with the white fabric/rope of the stools. 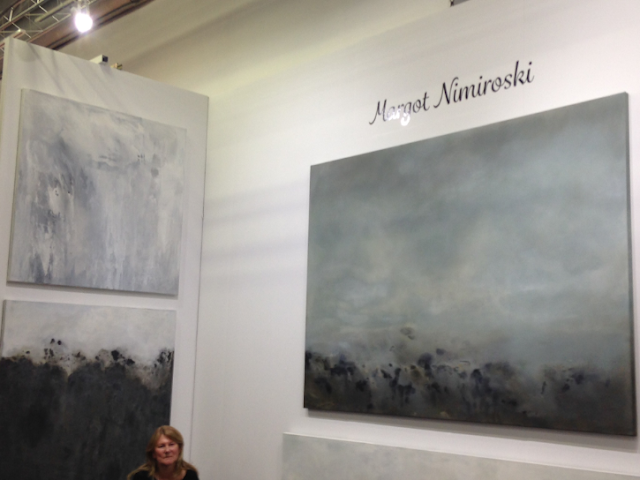 As I continued into the actual show leaving behind Dine By Design, I came across some booths that contained unique and inspiring art. One of my favorites was Tucker Robbins. His Monsoon Chandelier was amazing. Artist Margot Nimiroski featured her misty and mysterious ocean-scapes. I loved the somewhat abstract feeling of them. 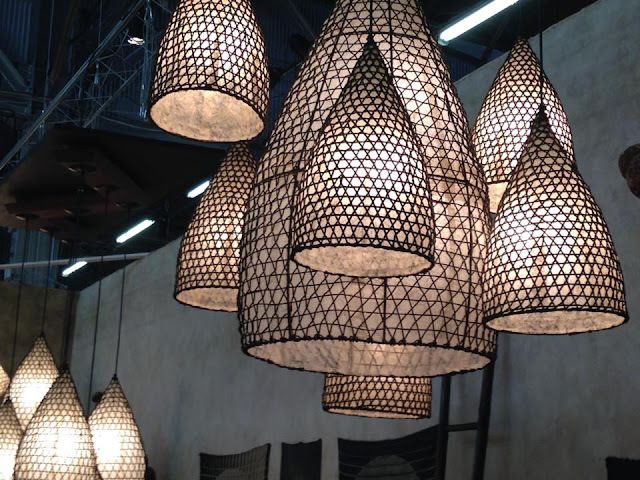 Michael McHale Designs creates industrial style lighting fixtures. He makes them from plumbing pipes. They are both elegant and industrial. His chandeliers were really wonderfully unique! Another show-stopper, as far as I was concerned, were the clay cubes and jacks from Next Step Studio. Artist Kaiser Suidan creates abstract geometric installations that play off of light, shadows, colors and architecture itself. I hope you were inspired by Architectural Digest Design Show 2017 as I was.